Save up to 80% over a contractor-installed floor! Complete ‘Job on a Pallet’ Armorpoxy II 2-Layer, ready-to-install floor coating System. Military grade 2 layer coating system consists of everything you need to prep, apply, and install your floor on virtually any surface. 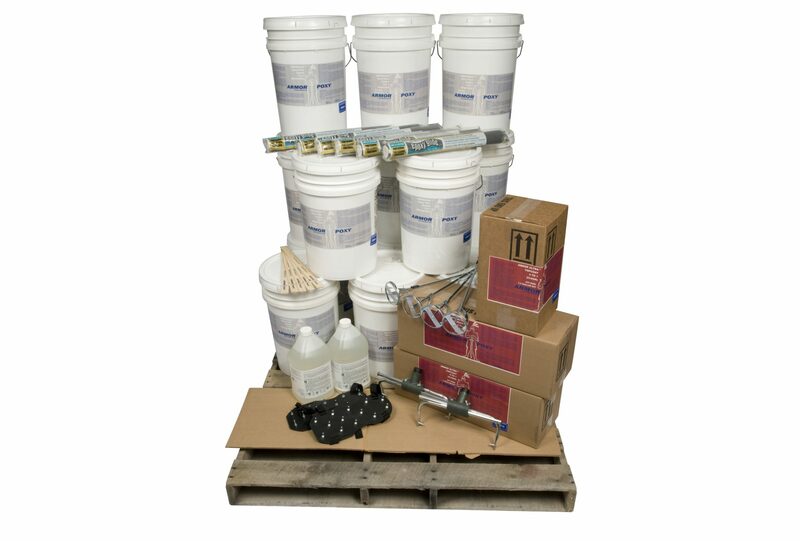 Kits include the following: ArmorEtch concentrated etch solution, Armorpoxy II self-priming 2-part industrial epoxy, ArmorUltra Military-grade 2-part protective topcoat (pigmented, not inexpensive clear), UltraWear high wear non skid powdered metal wear additive, power mixers (for your drill), mixing bucket with liner, 18″ industrial roller frames, 18″ epoxy roller covers, spiked shoe bottoms (for walking on wet epoxy, complete instructions and full, unlimited free telephone support. Please note that other colors are available. Certain colors such as white, off white, red, and other highly pigmented bright colors are supplied with an additional coat of epoxy and will charge out at additional 29 cents/ sq ft. Please order the number of square feet of your project. Minimum order size 1500 sq ft, orders 500-1500 sq ft 25 cents/foot surcharge. Smaller orders may go Fedex Ground and not on a pallet for faster service. Lead time 2-3 days plus transit time. Additional colors, including all OSHA-Approved safety colors are available for base coats or line/hazard marking. Please contact us for any special requests, ‘decorative chip’ projects, high acid/chemical resistant projects, electro static dissipating, and any other type of special or unusual floor, or for floor repair special products to repair cracks and floor damage. For ‘fleck’ type floors please call us to order due to the many color combinations available 888-755-7361 9-5 EST M-F. Please note that changes in VOC laws in certain states require selection of the ‘Low VOC’ version of Armorpoxy II Job on Pallet (Price per square foot is higher by 19 cents/sq ft due vs. standard Armorpoxy II Job on Pallet due to higher material costs since we have to substitute the standard Armorpoxy II with the Low VOC Armorpoxy II). Current states that these laws apply to are CA, CT, DE, ME, IL, IN, MD, MA, NH, NJ, NY, OH,PA,RI,VA. Orders shipping to states not listed as “Low VOC Required”, please see JOPCUSTOM for standard VOC version. Low VOC product can of course be shipped to all states if that option is preferred.